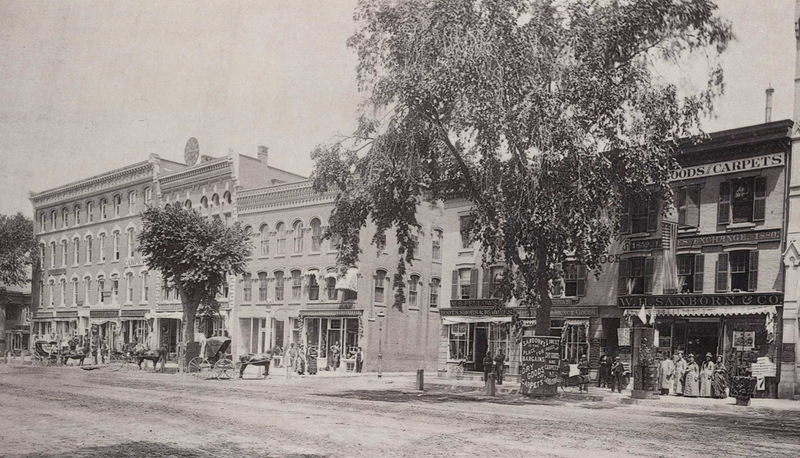 Looking west across the Common toward Park Square in Greenfield, sometime around the 1880s. Image from Greenfield Illustrated. The Common is at the heart of downtown Greenfield, and over the past 130 years or so, not much has changed in this view. This scene includes three historic buildings, which are partially hidden by the trees on the Common. 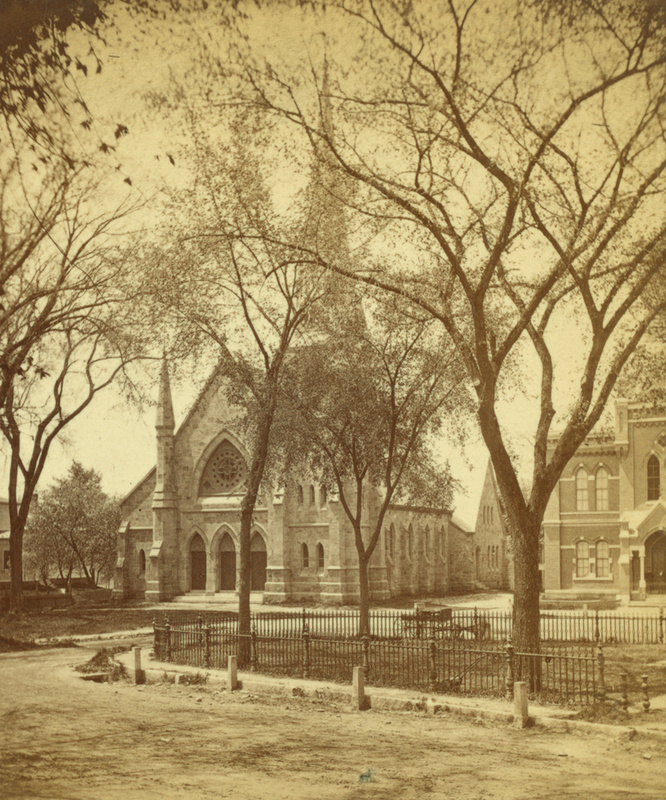 To the left is the Second Congregational Church, which was built in 1868 on the site of an earlier church and is still standing, largely unchanged. To the right is another well-preserved building from the same era, the George A. Arms Block. Built in 1876 at the corner of Main Street and Court Square, this four-story brick building is one of many surviving 19th century commercial blocks in downtown Greenfield. The building in the center of both photos is also still standing, although it has undergone far more drastic changes than the other two. Built in 1848 as the Franklin County Courthouse, it was originally a wooden Greek Revival building designed by Isaac Damon, a Northampton architect who designed churches, courthouses, and bridges across Western Massachusetts. 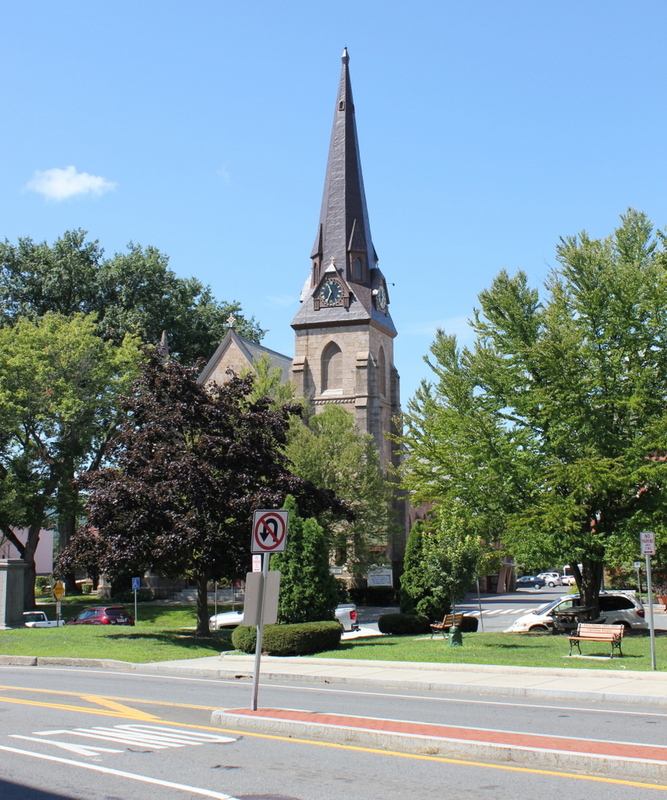 A few decades earlier, he had designed courthouses for Hampden and Hampshire Counties, and he had also designed Greenfield’s original Second Congregational Church just to the left of the courthouse. In 1872, Damon’s courthouse was essentially rebuilt, with little if anything left from the original structure. Because of the need for a more fire-resistant place to store county records, the exterior of the courthouse was covered in brick, and it was redesigned in a Gothic Revival style, in keeping with the architectural tastes of the era. The building’s design was again altered in 1954, when the exterior was renovated to its current Colonial Revival appearance. Today, the building is now Greenfield’s municipal building, and it, along with its neighbors to the left and right, are part of the Main Street Historic District on the National Register of Historic Places. 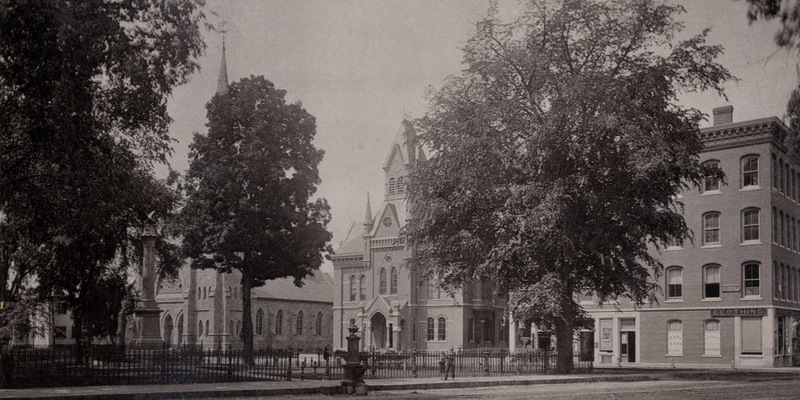 The Second Congregational Church on Court Square in Greenfield, around the 1870s or 1880s. Image courtesy of the New York Public Library. Greenfield’s Second Congregational Church was established in 1817, during a time when many New England churches were experiencing division. Here in Greenfield, though, the source of the dispute was not theological but geographical, as the two factions could not agree on a location for the meetinghouse. Ultimately, the offshoot congregation built their church here in what is now the center of Greenfield. 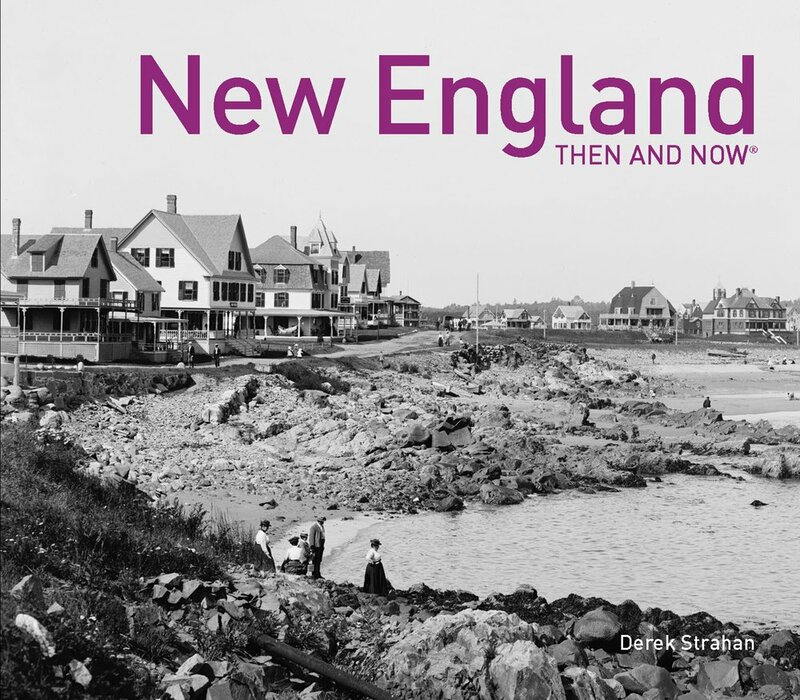 Their first building was designed by prolific Western Massachusetts church builder Isaac Damon. This brick Greek Revival design was copied a few years later and a few miles south of here in Deerfield, and still stands today as part of Historic Deerfield. Here in Greenfield, though, the old church was demolished in 1868 and replaced with a new building on the same site. By this point, the Greek Revival style of the early 19th century had fallen out of style, and Gothic Revival had become prevalent in post-Civil War churches. This church was designed by the Boston firm of Richards & Park, and included many of the common Gothic Revival features, including a stone exterior, an off-centered steeple, and pointed arches over windows and doors. The church is still standing today, essentially altered from its original appearance. It is one of many surviving 19th century buildings facing the Common, and is part of the Main Street Historic District on the National Register of Historic Places. The American House at the corner of Main and Davis Streets in Greenfield, sometime around the 1880s. Photo from Greenfield Illustrated. In modern-day redevelopments, architects often attempt to preserve the facades of old buildings, even if everything else is being demolished and rebuilt, and incorporate them into new structures. Especially in historic urban settings, this helps to maintain the visual appearance of the street while at the same time allowing a new building to occupy the site. However, in the 1960s the trend was the exact opposite. Many historic buildings had their original facades removed or covered, which the rest of the structure survived more or less intact underneath. 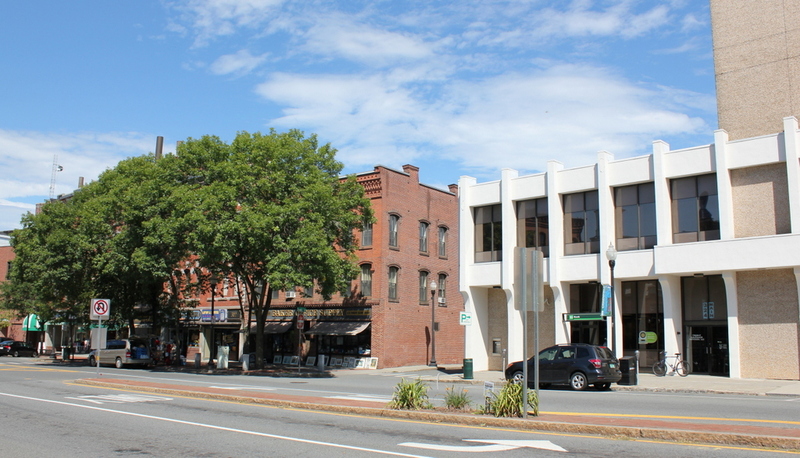 This was the case for several buildings along Greenfield’s historic Main Street, including this architectural monstrosity in the center of the photo. It was originally built in 1876, a few years before the first photo was taken, and was known as the American House. 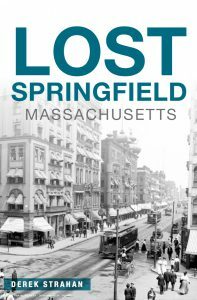 At the time it was Greenfield’s largest hotel, with a hundred guest rooms on the upper floors. The first floor had several stores, including a clothing store that was purchased in 1896 by John Wilson. 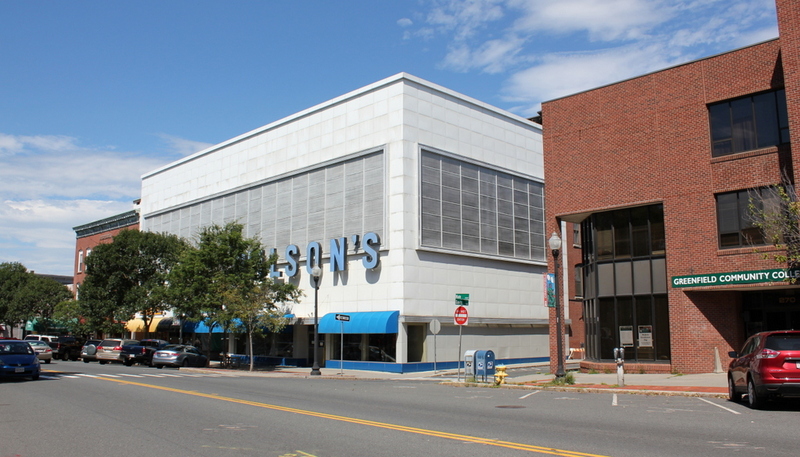 He turned it into a department store and soon expanded into the second floor, and his business has remained here in the building ever since. As for the hotel, it went through several other names, including the Devens Hotel and the Hotel Greenfield. Over time, though, the department store gradually expanded into the former hotel section. The building is still standing today, although it is completely unrecognizable from its original appearance. In 1965 its exterior was remodeled, with a metal facade that covered the original Italianate exterior. This original facade is probably still hiding under there, though, so perhaps someday the bland, warehouse-like exterior will be removed and the building restored to its 1870s appearance. Although the American House has survived more or less intact under its mid-century shroud, the same cannot be said for the other historic building from the first photo, the Colonnade Block on the right. It was built in the 1790s as the home of Jerome Ripley, a prominent resident whose children included George Ripley, a Transcendentalist writer who founded the Brook Farm utopian community. In 1842, Dr. Daniel Hovey added the columns and portico to the front of the building, and for many years it was a commercial building known as the Colonnade Block. It stood here until 1975, when the 18th century structure was demolished to build a bank building, which is now a branch of Greenfield Community College. The north side of Main Street at the corner of School Street in Greenfield, sometime around the 1880s. Image from Greenfield Illustrated. 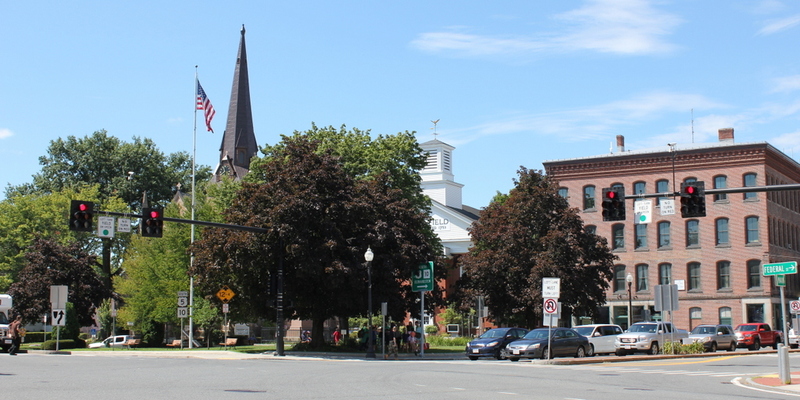 Greenfield’s Main Street is lined with a number of historic 19th century commercial blocks, including several in this scene, located opposite the Common. The ones on the left are partially hidden by trees in the present-day scene, but they are the same ones that stood here in the first photo. Starting on the far left is Pond’s Block, a four-story Italianate building that dates back to around 1874. Just to the right of it is the smaller but architecturally similar Hollister Block, which was built around the same time. Both were built on the former site of the Long Building, which had burned down in 1873. The Bird-Hovey Block, at the corner of School Street in the center of the photo, also matches the architecture of the other two buildings. However, it is actually far older, with parts of it dating back to 1812. It originally had two stories, but in 1872 a third was added. During this renovation, the current Italianate facade was also added, in keeping with commercial architectural trends of the mid-19th century. 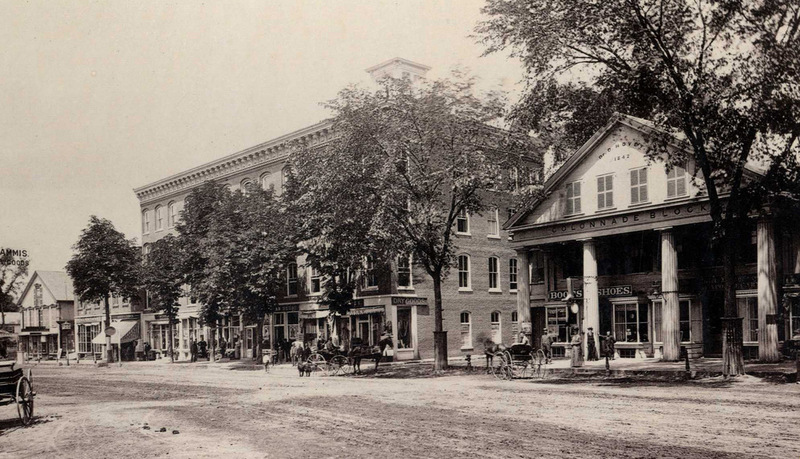 Today, the Bird-Hovey Block stands as the city’s oldest surviving commercial building, and its neighbors to the left are also still standing, with largely the same appearance as they had in the 1880s photo. Together, they form part of the Main Street Historic District on the National Register of Historic Places. The only major difference between the two photos is the building on the right side. It was built in 1870, and stood here for about a century until it was mostly demolished to build the Franklin County Trust Building in 1972. Parts of the old building were incorporated into the new structure, but there is nothing recognizable on the exterior. Today, the building houses Greenfield’s branch of TD Bank.